Unlike Windows, you won’t be needing to utilize the task manager often – but there’s still a chance that your system might just freeze and stop responding in the middle of your work. You just can’t press Alt+Ctrl+Del (like Windows) / command + option + escape (like Mac) to kill the applications/processes. For Linux, there’s another keyboard shortcut which will open up the terminal and then you would need to launch a Linux task manager. In any case, you will be needing the task manager – either to monitor the system resource utilization or to kill/end processes and to set task priorities. So, in this article, we will let you know about the Linux task manager keyboard shortcut (somewhat equivalent to Windows’s task manager shortcut) and will also list out the best Linux task managers out there for you. Note: The task managers for Linux that are listed here, are ranked according to my personal preference. Your choice might differ for obvious reasons. Of course, the default task manager that comes baked in with your Linux distro (which depends on your desktop environment) is usually the “System Monitor“. 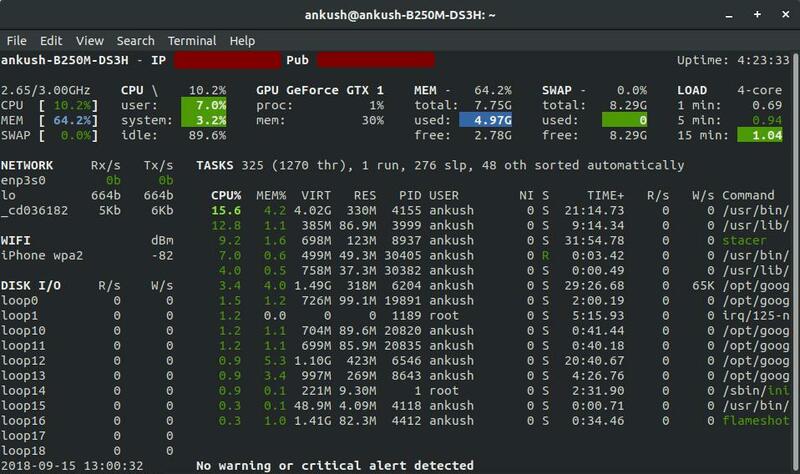 It does count as one of the best task managers for Linux – but then, there are better alternatives as well. Below, you will find the list of best task managers available for Linux which includes the default task managers as well. 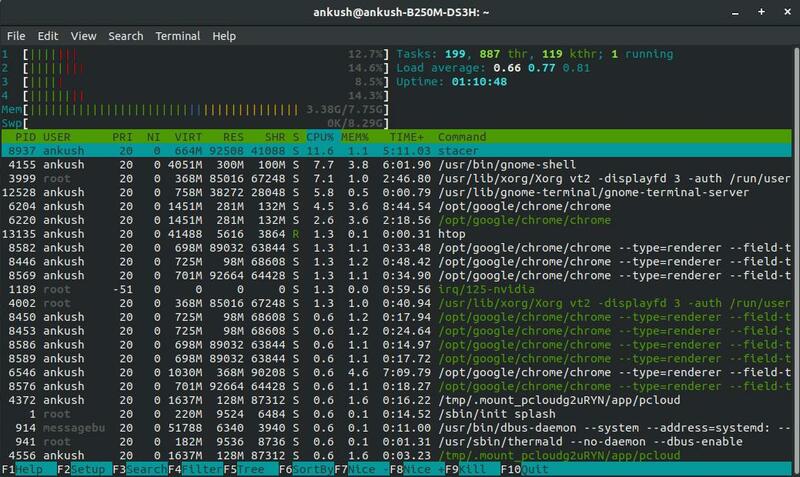 The best GUI-based task manager for Linux, which is easy-to-use as well. It lets you manage the startup programs, add/remove repositories, check resource usage history, and a few other things. It features a dashboard which gives you an idea of the overall system resource usage. 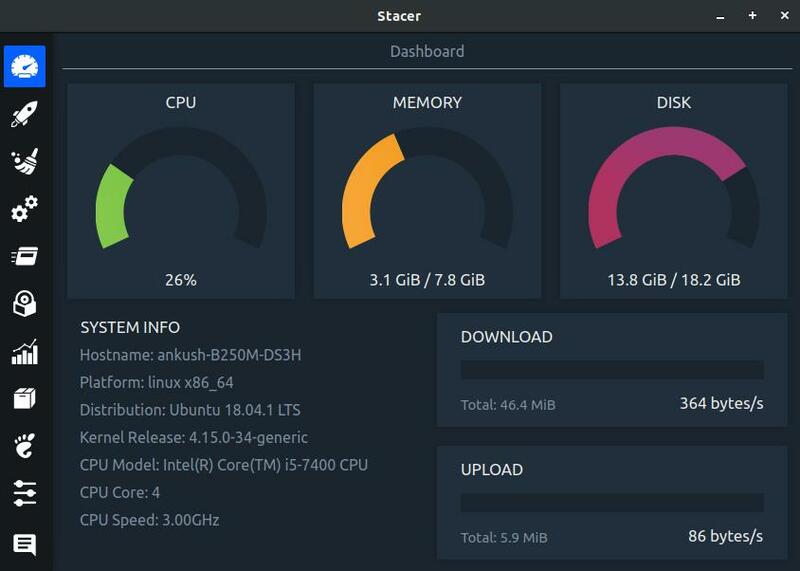 Stacer is my favorite pick as one of the best task managers for Linux with a GUI (Graphical User Interface). If you are on the lookout for an all-in-one task manager that lets you manage your processes while also letting you do a lot more stuff – you should get it installed. For installation instructions on other Linux distros, you should check out their GitHub page. In addition to process management, it also lets you control the startup programs, uninstall applications, free up space (cache, trash, and crash reports), manage repositories, check resource usage history, You can also tweak the settings to change its appearance and behavior. A user-friendly text-based task manager for Linux. It lets you filter the processes and kill them. You get to see the system resource usage while you manage the processes. 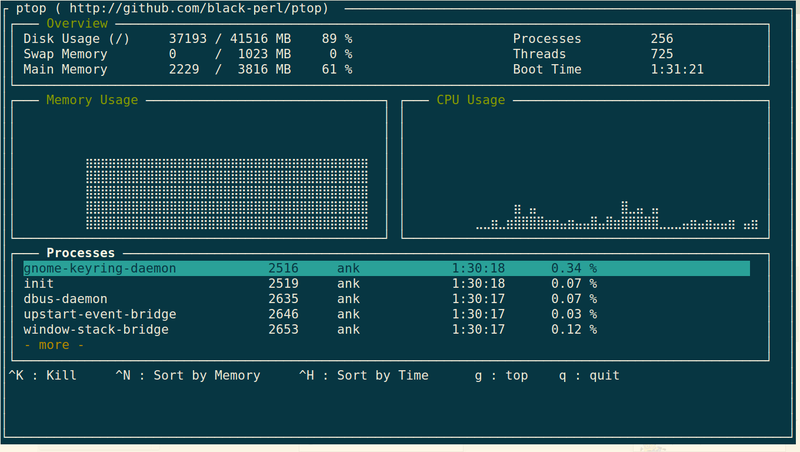 If you are not a fan of GUI-based task managers, Htop would be the alternative. It is originally based on “top” – another text-based task manager. 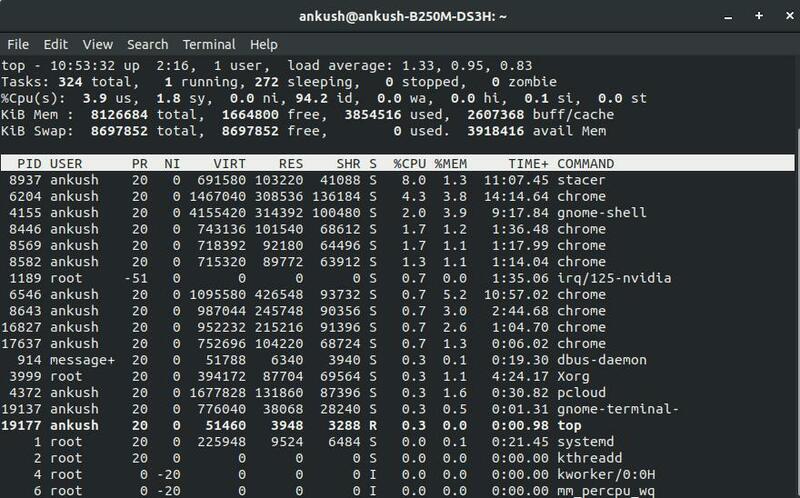 For a fact, it is better than that and it is currently the most popular terminal-based task manager. With this installed, you can check your system resource usage while being able to manage the processes running. For other Linux distros, you can refer the GitHub page to compile it using a tarball release. Even though it is a text-based task manager, it is very easy to understand. It lets you kill a process, or search for a process, or just break down a parent process (Tree) to reveal every other process associated with it. You can either check out their official website or head to its GitHub page to know more about its source code. In addition to process management, you get to see the system resource usage as well. 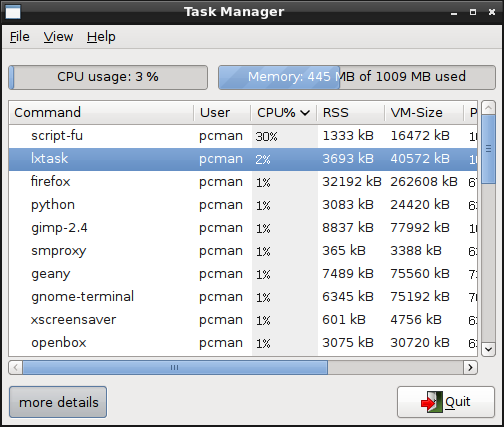 Top is the default text-based task manager for most of the Linux distros. It is a text-based task manager and it is a bit more complex than Htop. For instance, you need to search for the exact process number in order to kill it. But, in Htop, you don’t. I can’t really justify using this over Htop – but if you are someone who does not care about the ease-of-use. It is definitely one of the best task managers for Linux – nevertheless, alternatives are always good. The default task manager for GNOME desktop with a GUI. You can manage the processes and check your system’s resource usage. 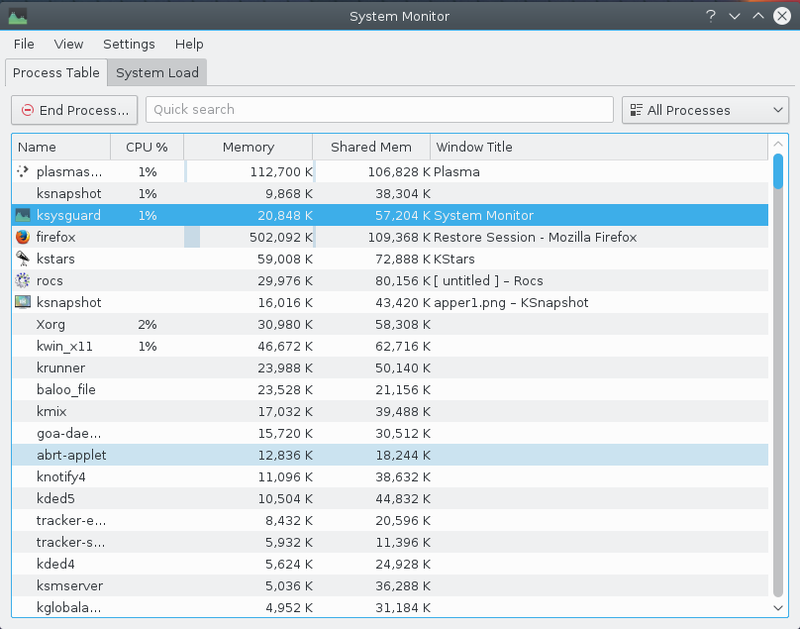 System Monitor is the default GUI-based task manager for Linux systems with GNOME. You just need to search for it in the app drawer. You can manage the processes running, check your system’s resource usage, and keep an eye on the file systems. It is a dead simple task manager with a GUI. The default task manager for KDE-based distros. It is essentially the same as GNOME’s system monitor, but for Linux distributions with KDE Plasma as their desktop environment (like Kubuntu). Tailored for LXDE/LXQt desktop environment. It is a light-weight task manager for low-end systems. LXTask is purely meant for the users using older hardware. It does have a graphical user interface – but then – it is tailored for LXDE/LXQt desktop environment which is usually utilized for low-end systems. It offers the same level of control as the System Monitor does – but with a little bit more details for individual processes while being a lite version on system resources. It is useful for task monitoring but not managing them. It gives you detailed stats of your system resources. 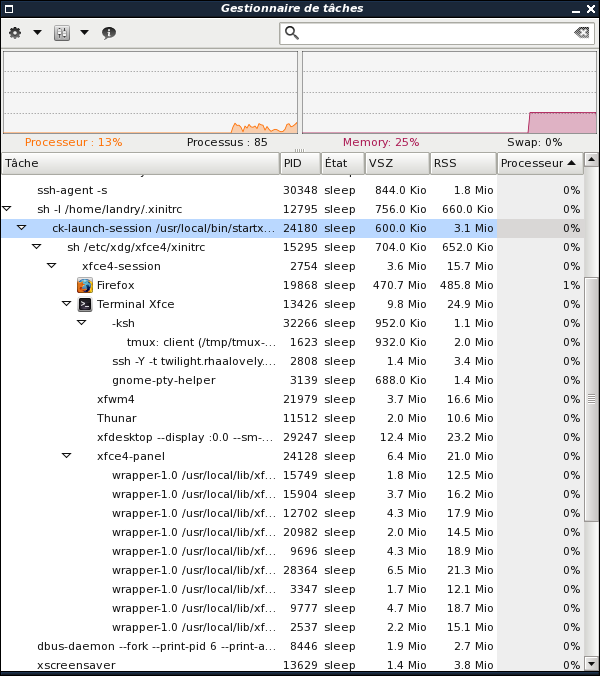 Glances is not technically a Linux task manager but it does have a role in it. You get detailed insights into the processes running at a glance – that’s what it is meant for. It tries to present a whole lot of useful data in a single window. You get to know about your system resources, network performance, hardware configuration, and the uptime as well. All the information you will ever need is just a glance away. The default task manager for XFCE-based Linux distributions. It lets you expand the process tree and manage them. You get to check the system resource usage as well. This is yet another default task manager for XFCE based Linux distro (like Linux Mint with XFCE). It offers a graphical user interface as well. Similar to some of the others mentioned above, it lets you expand the process tree and end the individual processes within it. In addition, you also get to check your system resources. ptop is an Htop or top alternative with a different take on the user interface. It lets you manage the processes and also gives you the insight of your system resource usage. ptop is an inspired project from vtop (which is an open-source task manager for macOS). Well, functionality-wise you will not find anything new. It offers the same set of features Htop offers. However, its text-based UI is somewhat engaging and it also supports a couple of themes for you to customize its appearance. A light-weight task monitor which is independent of the desktop environment – unlike LXTask. It features a lot of information to look at – which makes it a compelling option as a task monitor. Conky is yet another light-weight task monitor which gives you helpful insights about your system, network and the processes running on it. Unlike other system monitors, it presents you a lot of information – which includes the song you’re listening to. It should be a nice addition to your desktop – if you are fond of keeping various programs as widgets on your desktop home screen. 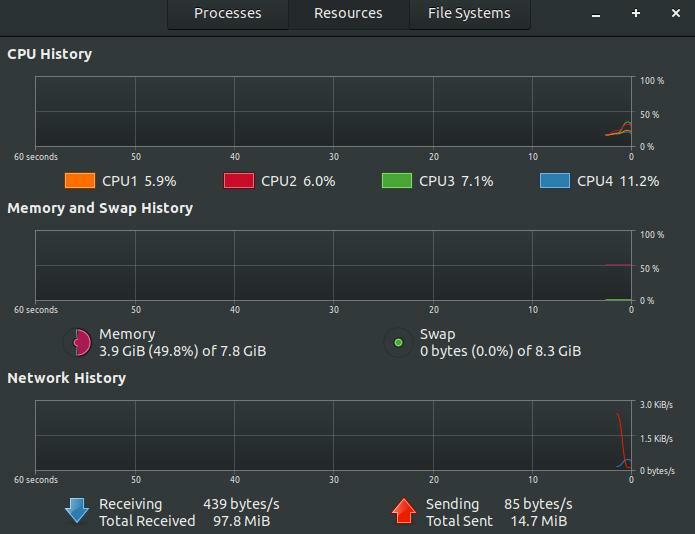 Now that you’ve known about the best task managers for Linux, take your pick! Which one of the above do you like the most? Or did we miss any of your favorites? Let us know about it in the comments below!